A native of Suffield, Cookie attended Suffield High before the advent of girl’s interscholastic sports. She nonetheless played four years on her class intramural basketball squad leading the team to four consecutive finals (a game played before the entire student body). It was highly unusual for Freshman and Sophomore teams to make the finals. She was a three-year varsity cheerleader serving as captain her senior season. While attending Southern Connecticut State College, she played three years of field hockey and two years of basketball. In 1964, working with Becky Laemal, the two women organized the first formal recreation program in Suffield. Cookie later served on the Recreation Commission for several years. 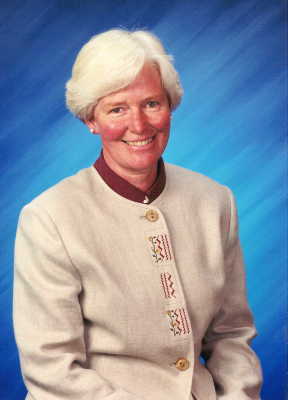 She joined the Enfield School System in 1965 to teach physical education and to coach. She is in her 37th year of coaching field hockey where her teams have won five State Championships, been State runner-up once, and won nine League Championships along the way. Her teams have finished atop the Courant Coach’s Poll (best in the State) twice and two of her players were high school All-Americans. She was the girls basketball coach at Enfield High for 17 years and spent 10 years as varsity cheerleading coach. She was Division M Field Hockey Coach of the Year four times, Connecticut High School Coaches Association Field Hockey Coach of the Year, and National High School Coach of the Year in Field Hockey. The Connecticut Sports Writers Alliance named her High School Female Coach of the Year in 1995. She was in the first induction class of the Enfield Athletic Hall of Fame, a member of the New Agenda: Northeast Hall of Fame as a high school coach, and a member of the Connecticut High School Coaches Association Hall of Fame. Cookie has served on numerous Connecticut High School Coaches Association and Connecticut Interscholastic Athletic Conference boards for field hockey. In 2003, she retired from active teaching but remains varsity field hockey coach at Enfield High School.